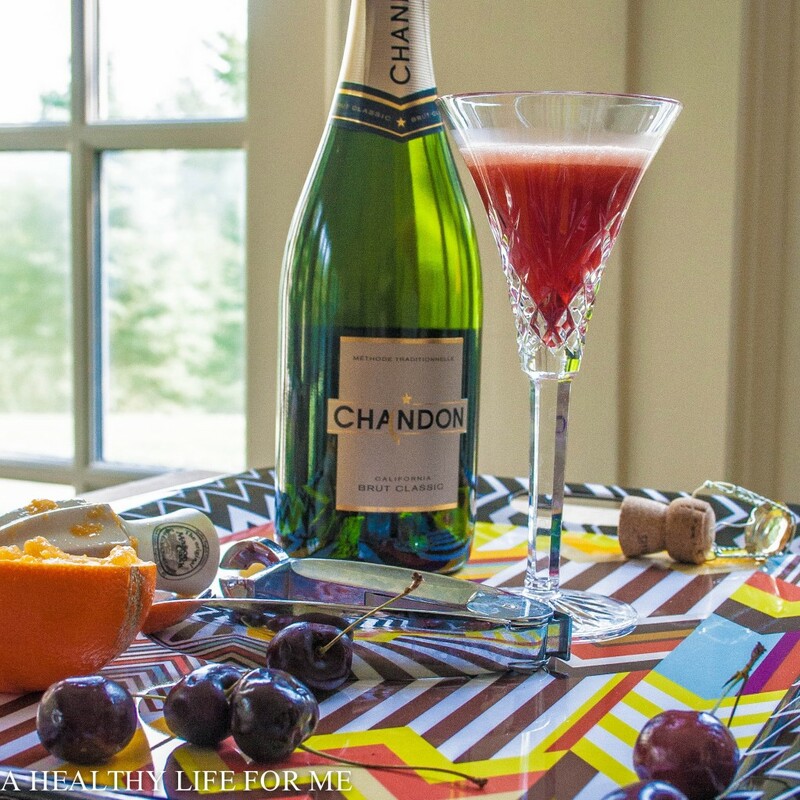 Post # 326 Happy National Champagne Day! 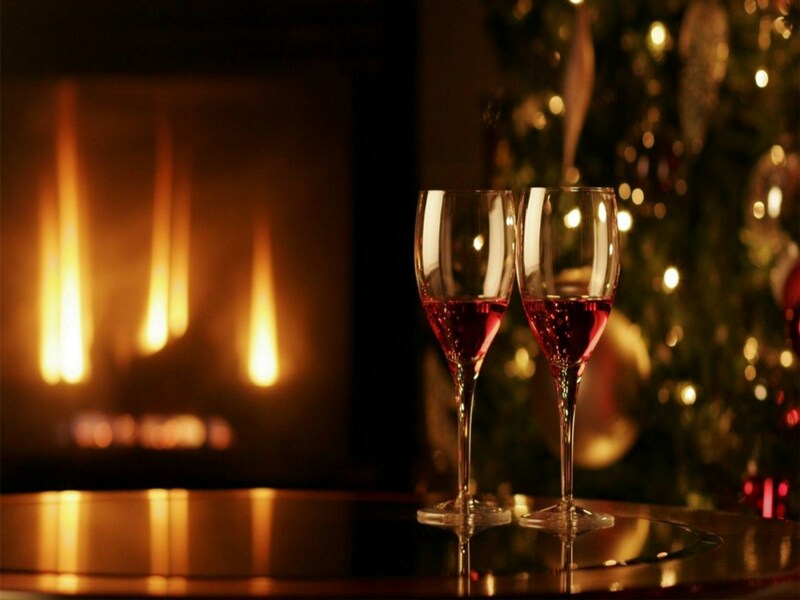 December 31, 2014 at 1:35 PM | Posted in Uncategorized | Comments Off on Post # 326 Happy National Champagne Day! What a surprise that National Champagne Day falls on New Year’s Eve, huh? It should come as no surprise that I quite like the stuff. I was on an airplane once, coming home from somewhere overseas in business class. I had the book “Wicked” with me and I had just started it. The flight attendant and I were discussing it, and she said that she was third in line for it in the company library. I promised to give her my copy if I finished it before the flight was over. She sat me down and made sure I didn’t get up for anything except the lavatory. I was still 30 pages from the end, but I lied and gave it to her. Just as I got off the plane, she and her friend gave me two bottles of Moet & Chandon champagne that were left over. Even exchange. 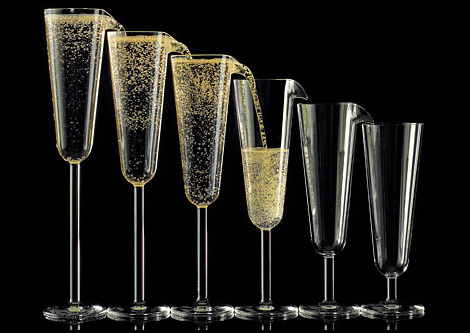 New Year’s Eve is most associated with champagne at midnight, but other celebrations have champagne. Weddings, births, etc. Mother’s Day is another popular one. Mostly in the form of mimosa. Which is what this post is about. 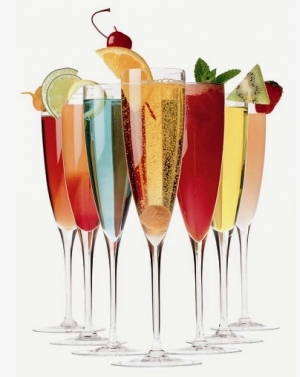 Mimosas, strictly speaking, is simply fruit juice mixed with champagne. Some people like a lot of juice and little champagne. Some people like a lot of champagne and a little juice. Some people like it half and half. I think it depends on the juice and the champagne. 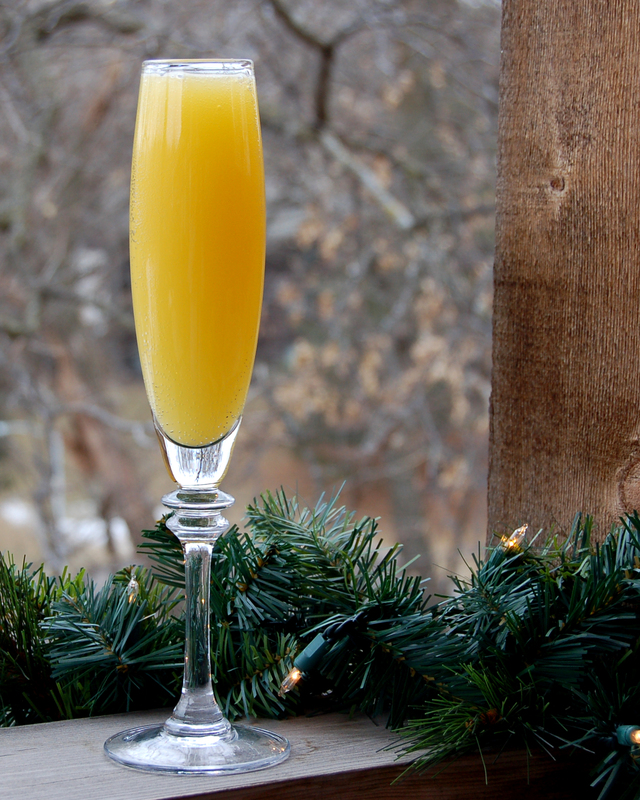 Most of the time, when people say “mimosa” they are referring to orange juice and champagne. However, mimosas can be made with all kinds of juices. Orange mimosa to be really good must have quality champagne and quality orange juice. I find that the combination of bitter with sweet makes a delicious drink. You don’t want bitter orange juice and very dry champagne. It tastes only bitter and isn’t pleasant. I like a sweet orange juice with medium to low pulp and a good tasting medium-dry champagne. I want as large a glass as possible, but I don’t want the drink to warm up before I’m done so I usually use a red wine glass with a large bowl. I fill the glass 2/3 with champagne and 1/3 with orange juice. 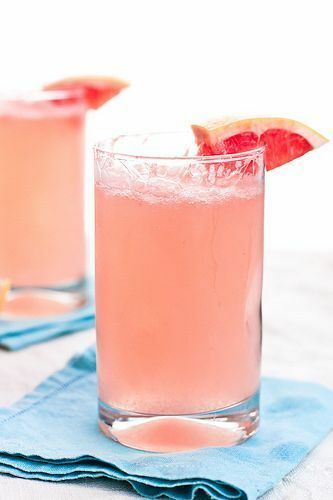 Makes a wonderful, refreshing drink that I could swill all day long. Several years ago, I was going to a friend’s house for Sunday brunch. I told her I’d bring the mimosa fixings which pleased her greatly. I brought three splits of chilled champagne, Korbel Natural, my go to label. I also brought cherry juice concentrate and frozen sweet cherries. I put a couple of spoonfuls of concentrate in the glass, two cherries, and filled it to the top with champagne. She sipped it and declared, “This is my new favorite drink!” It certainly did taste good. Other times, I’ve crushed frozen cherries in the glass and poured the champagne over them. It tastes very good. 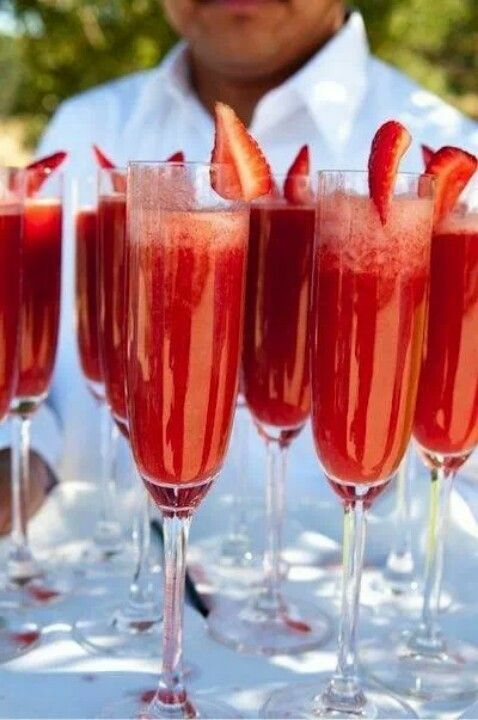 For some reason, a lot of people eat strawberries and sip the champagne through the berry. I don’t like strawberries, but I could definitely see their value in champagne, as long as they are sweet. 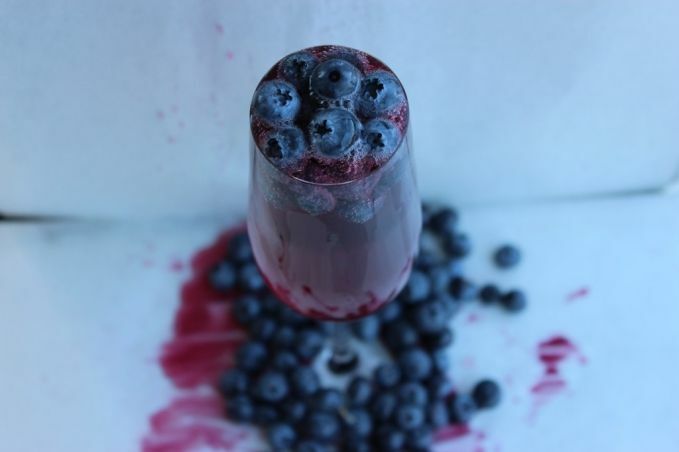 Another of my favorite berries is blueberry, and I’ve enjoyed a lot of blueberry mimosas. 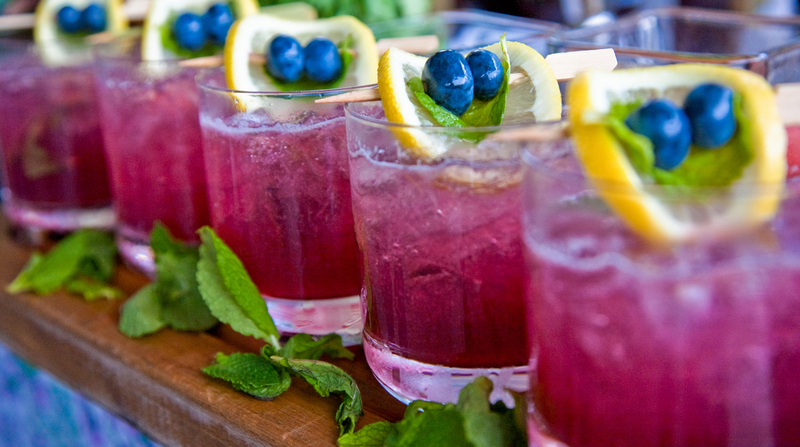 Crush the berry into the glass and pour the champagne over. Yum! 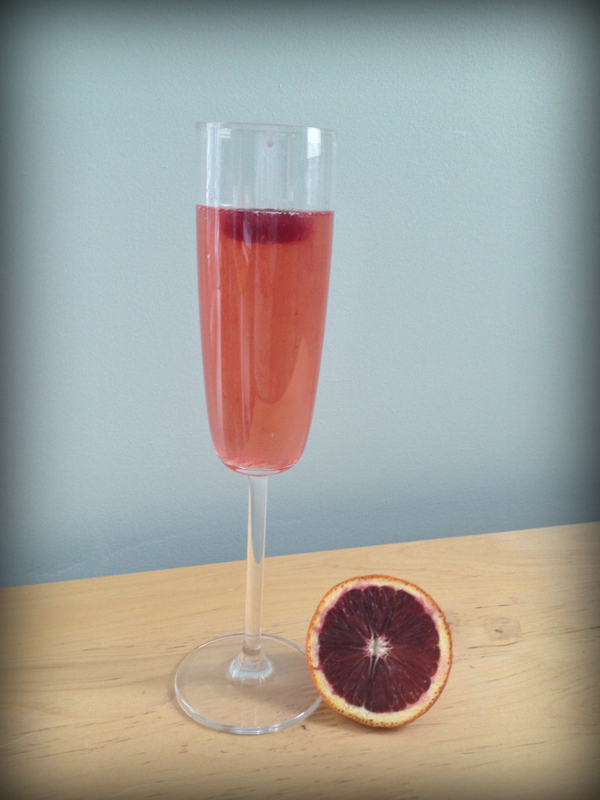 I’ve also had something called a Bleeding Mimosa that’s made with blood oranges. It was okay, but a little too bitter for my taste. 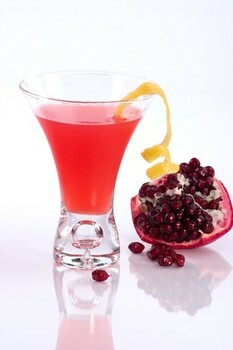 If you want to go with a “healthy” version of a mimosa, you can use the “superfruit” pomegranate. I was at one restaurant’s brunch and enjoyed a citrus mimosa. It had various citrus fruit, plus mint and blueberries. The combination of flavors was very refreshing. 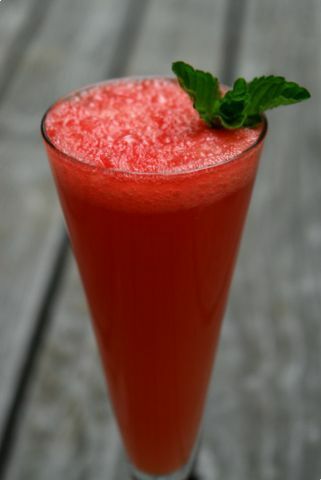 And finally, there’s always a crushed watermelon mimosa. I love watermelon, so I can’t wait to try it. However you’re going to drink your champagne today or tonight, please enjoy yourself and say goodbye to the old year. 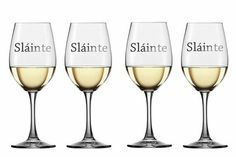 Slainte (Irish – Slan-chu), to your health! I recently read that mayonnaise is now America’s favorite condiment. I’ve written in this blog before about how I feel about mayonnaise. For those who haven’t read that post, or don’t remember (there’s been a lot written here about food), I don’t care very much for mayonnaise. It falls into the “white and fluffy” category of things I don’t like too much. It has its place and it has its uses. On the whole, I’d just rather not. The second favorite was salsa! That surprised me. I like salsa a lot. I was practically raised on the stuff. One of my favorite snacks is tortilla chips and salsa eaten by the gallons. It was the third favorite condiment that surprised me. It was ketchup. For decades, ketchup was America’s #1 condiment. Sweet, tangy, viscous and tomatoey, ketchup as we know it has been around since about 1801, when the first recipe for it appeared in print. Before that, ketchup was a table sauce made from various ingredients that mostly had nothing to do with tomatoes. Way back in the day, the Chinese had a fish, spice, and brine sauce that served the same function and was called by something that sounded just like ketchup. In the UK, a sauce made from mushrooms and spices was referred to as ketchup. When the tomato ketchup became popular, the mushroom variety slowly disappeared, although you can still find it there if you look for it. Today, ketchup in the UK is referred to at ketchup or sauce, interchangeably, I presume to differentiate from the mushroom ketchup, which came first. I’ve never tried it, and if I run into it, I’d be heavy pressed to actually put some on my plate. But The Rule dictates otherwise, so I’ll probably try it. 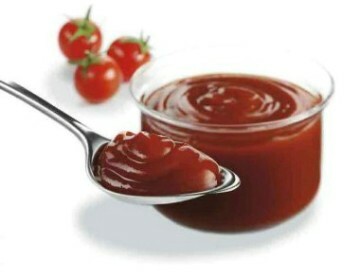 Ketchup is a blend of tomatoes and spices and in its infancy, every household had its own recipe. There’s a great scene in the classic Judy Garland movie “Meet Me In St. Louis” where the housekeeper is making ketchup on the stove and everyone in the large family adds sugar and salt in turns to make it to their own tastes. Somehow it’s successful despite the “too many cooks” process. 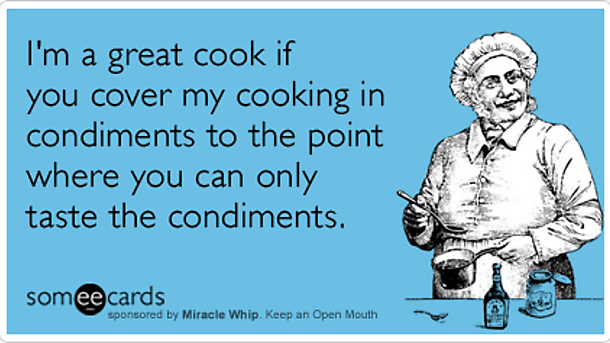 Since you can get ketchup anywhere at any time and sometimes for free here in America, I’ve never tried to make my own. But here’s a recipe if you’re adventurous enough to try it. It’s easy to make. I just don’t know how to bottle it or store it. Pour ground tomatoes into slow cooker. Swirl 1/4 cup water in each emptied can and pour into slow cooker. Add sugar, vinegar, onion powder, garlic powder, salt, celery salt, mustard powder, black pepper, cayenne pepper, and whole clove; whisk to combine. Cook on high, uncovered, until mixture is reduced by half and very thick, 10 to 12 hours. Stir every hour or so. Smooth the texture of the ketchup using an immersion blender, about 20 seconds. Ladle the ketchup into a fine strainer and press mixture with the back of a ladle to strain out any skins and seeds. Transfer the strained ketchup to a bowl. Cool completely before tasting to adjust salt, black pepper, or cayenne pepper. I think I’d only attempt this if I had nothing better to do on a weekend. Now oddly enough, since ketchup is primarily tomatoes, and tomatoes don’t lose any of their health benefits when they’re cooked, ketchup is actually good for you. It contains protein, carbohydrates, minimal fats and sodium, vitamin C, and lycopene. The lycopene becomes concentrated as it cooks so you tend to get more in ketchup than in just eating a regular tomato. Lycopene is an antioxidant that may help prevent some forms of cancer. A few decades ago, the national congress declared ketchup a vegetable for the purposes of school lunches. It was intended as a joke, but someone didn’t know that and allowed it to be carried through to completion. It was corrected quickly, but they weren’t that far off. Most of the time, you see ketchup as a dressing for sandwiches, or a condiment at a buffet bar. Ketchup get squirted out by the gallon in the little paper cup above to dunk your fries in. By the way, a little hint for you. You can unroll the edges of the cup, and pull out the folds, making a flat dish with your ketchup in the center to make dunking your fries easier. 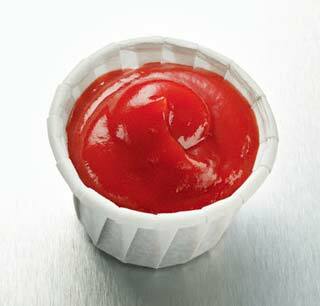 We’ve all seen the small plastic containers with a single serving of ketchup at fast food places. Single serving for a single french fry, I think. Back in high school, several of my friends would squeeze those packets directly into their mouths. Grossed me out, but “It’s ketchupy!” they’d say. Ketchup can also be used as a base for other sauces. 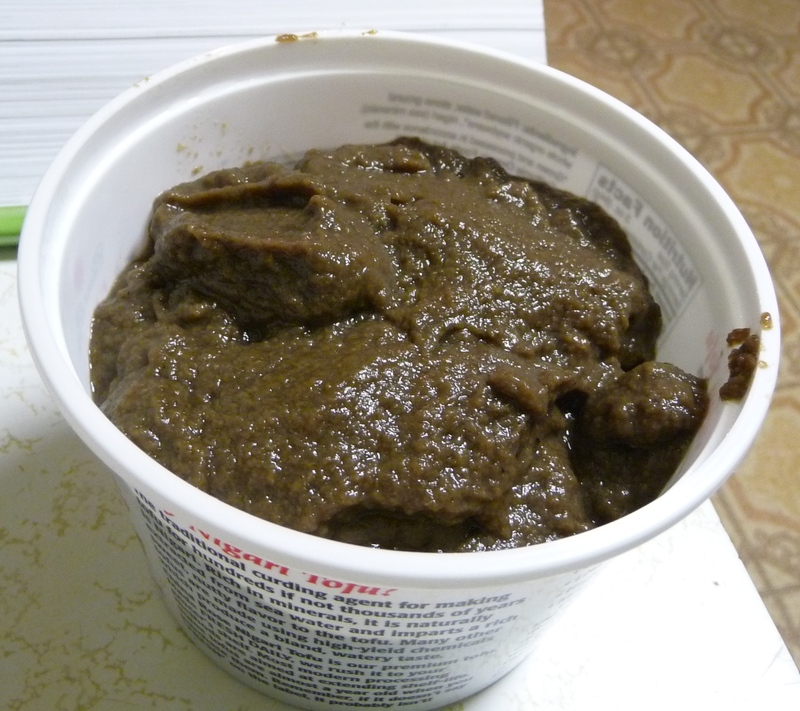 Salisbury Steak, barbeque sauces, some salad dressings, cabbage rolls, porcupine meatballs, and the list goes on. When I make meatloaf, which some of my friends have called vegetable loaf, I top it with ketchup and sesame seeds to glaze it as it cooks. It’s wonderful. All that being said, I don’t always put ketchup on the things we always put ketchup on. When I was about 5 or so, Mom had made hamburgers and french fries for dinner. There wasn’t enough ketchup in the bottle for all of us, so she put some on each of us kids’ plates and left hers with none. I asked why she didn’t have ketchup and she said, “Sometimes, I don’t like to have ketchup with my fries.” I was puzzled, but I tried it. For the first time, I tasted a potato that tasted like a potato! It was hot and crispy and wonderfully soft and mealy inside with a light touch of salt. It was like a gift for my mouth. Instead of tasting ketchup, I tasted the potato! I was in my teens before I put ketchup in my mouth again. I have a friend who like ketchup so much that when he had a hamburger, he’d open the bun and pour ketchup on it, at least half a cup. When he took that first bite, all the ketchup would squirt out the other side of the bun, so he’d open the bun and pour more ketchup on. He’d do that two or three times, then start dunking his burger in the ketchup mound on his plate. Then eat all his fries with the ketchup. If there was any ketchup left over, he’d get a spoon and scrape it into his mouth. Dude loved ketchup! 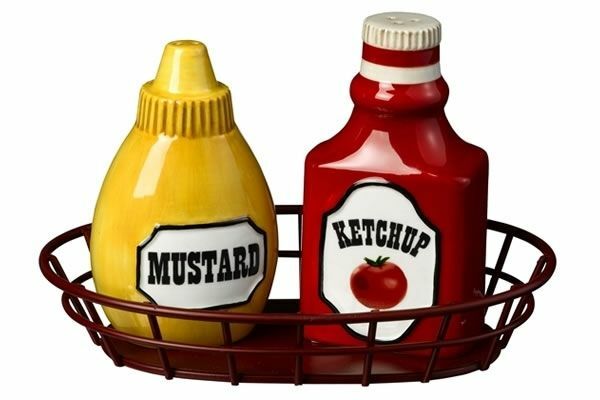 At a summer barbeque, the “big three” in the condiment circles are mustard, ketchup, and relish. For the record, my favorite is the yellow one on the left. Post # 324 Christmas After Tragedy, a short story by me! December 24, 2014 at 5:19 AM | Posted in Uncategorized | Comments Off on Post # 324 Christmas After Tragedy, a short story by me! It isn’t often that a blog post falls on a holiday like Christmas Eve. In that spirit, I’m offering a short story as a kind of present for you. This story has a history. Many years ago, when I was still married, our habit was to spend most of the holidays with my wife’s family at her parent’s house. I might do the cooking, or her sister might do the cooking. About a week before Thanksgiving, I asked everyone to think about their favorite Christmas memory and share it during Thanksgiving dinner. Later, I wrote down everyone’s memory. I intended to write a short story using those memories and give everyone a copy for Christmas. I gave myself a year to do this, but it never happened. I didn’t work hard enough on the story so it never came together the way I wanted it to. I kept the notes on the conversation on my computer so if something did gel, I’d have the info when I needed it. Fast forward a few years, and the country and the world were shaken to their core by the attacks on the Pentagon and World Trade Center. The world changed that day. I was about a quarter of a mile from the Pentagon when it was hit and the feelings from that day will always be with me. Alan Jackson wrote a song called “Where Were You When The World Stopped Turning?” During the introduction the first time he sang it publicly, he made a comment that went something like this: In the days after the attacks, everyone who could write a song, or a poem, or a story, or paint a picture tried to make sense of what had happened. It was another five years before I was able to make sense of what happened. When I sat down to write the following story, I was finally able to take the memories and the feelings that were in me to write something that made sense to me. I never mention which tragedy occurred in the story; it’s a story about any tragedy. Snow crunched under the Jeep’s tries, and Tony again thanked whatever god invented 4 wheel drive. That was the only thing that had gotten him to Virginia that night. It had snowed for two days, and traffic was at a standstill. Fortunately, he was familiar with the back roads. This year, more than any other, it was time to connect with family. Tony grinned as he got out of the vehicle, his arms loaded with colorful packages, beating back the darkness. It looked like the whole family was here. Threading his way through the maze of cars haphazardly parked in his sister’s driveway and yard, concentrating on staying upright, his grin widened. Mona and her husband, Rick, lived with Rick’s mom, partly for her sake and partly for theirs. The house was large, old, and very homey. Even before he made it to the front porch, the door opened and Rachel screeched through the cold air. Tony’s smiled widened further. Oh, to be seven years old again, when everything was still magical. “I know, kiddo.” Tony managed to climb the stairs and set his parcels down. Squatting, he threw his arms open. “How about a hug from my favorite person?” Rachel jumped into his strong arms and he closed his eyes, fighting the overwhelming emotions. Standing with the child still clasped around his neck, Tony walked into the warmth. Rachel giggled and held on tighter, almost cutting off his airway. “I’m here,” he called out. Faces poked out from a dozen corners, all of them lit with smiles. Suddenly, he was surrounded by more people than he thought was possible, all saying welcome in various ways. Gene and Janet reached out for Rachel. “You seem to have grown an extra person.” Janet said with a laugh. “Mommy, he’s got all kinds of presents out on the porch. Can I go get them?” Rachel had a way of focusing on the important issues. The hubbub and confusion continued for a few more minutes as Tony connected with his family. It had been such a short time since he’d seen them last, but it felt like a lifetime. So much had happened in just three short months. Tony went to the kitchen to get a glass of water. His father was there ahead of him. “Hi, dad.” He said softly. Dad turned and held his arms out. Tony moved into the hug and gripped his father fiercely, not wanting to let go. “I’m proud of you, son.” Tony wasn’t sure he’d heard the words and looked at his dad’s face. Tears stood in the older man’s eyes, but Tony knew they would never spill over. Tony looked down at his water, and the moment passed. He looked up and his dad was the normal jolly Santa he’d always been. “Who’s greedy?” Janet asked, walking into the kitchen. “What do you remember most about Christmas?” Tony asked. The small group made their way to the living room. Tony got his first look at the tree. It was huge and colorful, the epitome of what Christmas trees were supposed to be. Tony turned and saw Dave, his sister Tracy’s husband, talking to Gene. From only one sentence, he knew exactly what they were talking about. “I think the tree I’ll remember to my dying day is that first one when Mona got her condo. It was couple of years before she and Rick were married and she’d moved out on her own. She, Gene, and I all had one Friday off and she wanted to get a bunch of Christmas stuff. 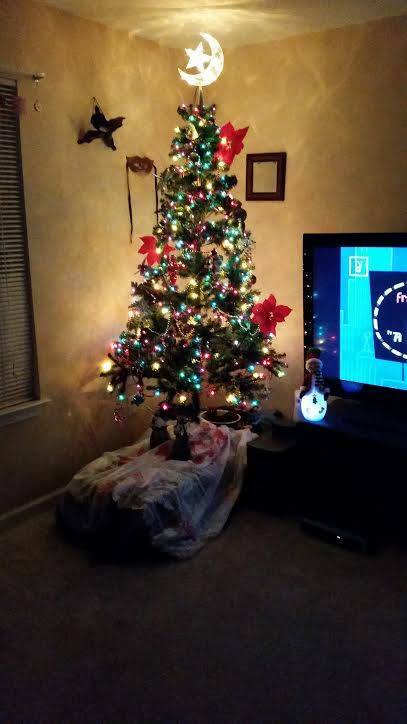 She bought this beautiful tree, full and green. But she got it too early and it dried out terribly. Every time the heater came on, you could here the spatter of needles hitting the wrapping paper. By Christmas morning, there was nothing but a stick with decorations on it and ring of brown needles on the floor around it.” Dave was in stitches by the time he’d finished. Tony was laughing out loud, too, at the memory. It had been kind of sad at the time, but now it was hilarious. “You’re still laughing about that?” Mona had snuck up behind them. “Mona, I’ll be laughing about that one forever.” Dave replied, still giggling. Tony looked around. “Where’s Cosmo?” The little dog was seldom very far from Tracy or Dave. Tony found a seat in a comfy chair next to the stereo. Christmas carols were playing softly, adding to the atmosphere. He called Rachel over to him. Rachel’s eyes lit up. “Okay!” She ran to the tree and almost immediately found the one in question. “Thank you, Uncle Tony!” Rachel kissed his cheek quickly, then tore into the package. For a few seconds it was as though a multicolored snow storm had hit the living room. All the adults watched as Rachel opened her package. It was the doll she had been wishing for since before school started. Her squeal of delight said her thank you more effectively than anything else. Suddenly Tony found himself tearing up. He looked over as his mother put her hand on his forearm. She looked concerned. “Just tired, mom.” He said. He looked back at Rachel who had the doll out and was dancing around with it. He used to mark her packages “from Santa”, but that wasn’t necessary anymore. “So many Christmases, but I think this one will stand out.” Tony said. “Every Christmas is the best Christmas.” Mrs. Stovak said. Tony smiled up at her as she offered him a plate of cookies. “Gene, what’s your favorite memory?” Tracy asked. She’d found her dog and she and Dave were cuddling it between them. Everyone laughed in varying degrees. Everyone looked at Tony with sympathy in their eyes. He’d had a rough few months. Tony looked to see where Rachel was. She was engrossed with her doll, not paying attention to the adults. He shook his head. “We know, dear.” Mom said. She put her arm around his shoulders. “Let’s get you a sandwich.” She always tried to fix things with food. He nodded silently. Looking around, he saw his family, those people he loved most in the world, looking at him with concern and love. He knew they wanted to do their part and that in itself helped pick his spirits up. Gradually, through the evening, Tony’s mood lightened and he started enjoying the holiday. But he was tired and finally had to say goodnight. Just before he closed his door, Rachel came in. After Rachel left, Tony laid back against he pillows looking at the stars. “Whoever is up there listening? Thank you for the kids.” He said softly. 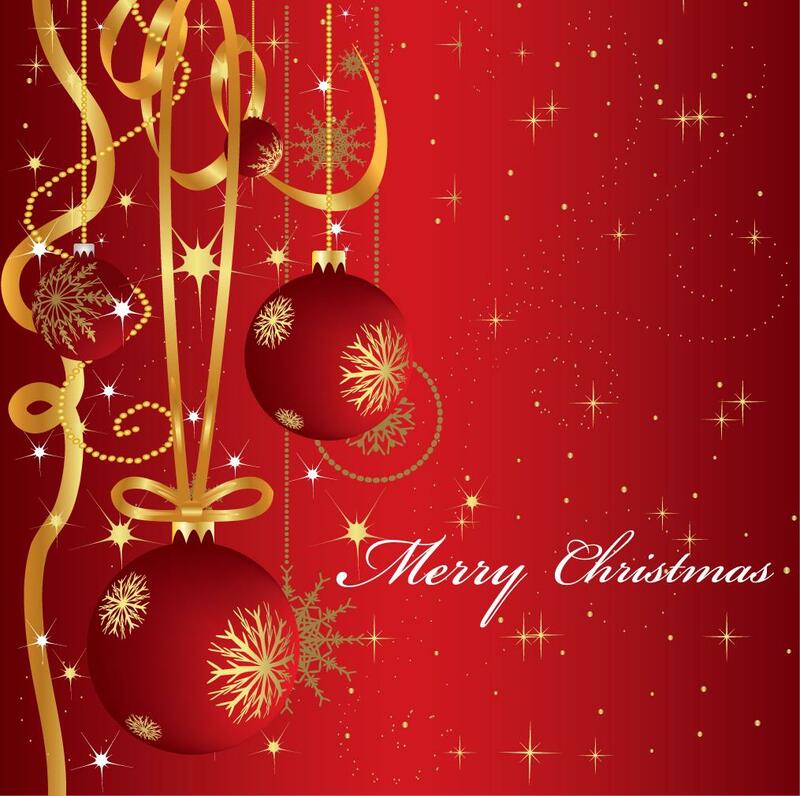 Post # 323 Happy Yuletide! December 22, 2014 at 12:24 PM | Posted in Uncategorized | Comments Off on Post # 323 Happy Yuletide! I goofed and missed last Friday’s post. With all the things I had going on that day, it slipped my mind and by the time I thought about it, it was way too late. I was going to tell you what we were planning for our Solstice Ceremony which was Sunday. So now, I’m going to tell you what we did for our Solstice Ceremony, which was yesterday. Partner/Spouse and I are spiritual people, but not religious. We identify as pagan since we follow a more earth-centric discipline rather than a faith-based Judeo-Christian discipline. We’re caretakers of the earth and the spirits of the earth and the universe. We pay close attention to the changing of the seasons and the feasts that are concurrent with the changes. There are four major feast days, and four minor feast days. 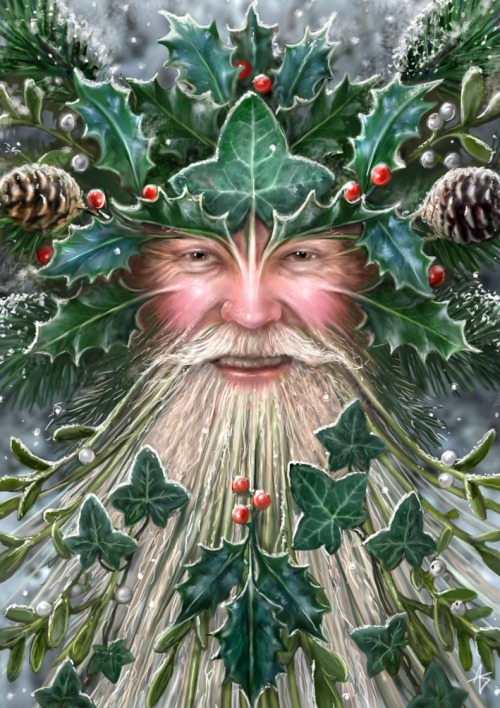 The winter solstice is a major feast day. It’s the shortest day of the year. It’s the time when the dark and cold hold the land in its grip and doesn’t seem to want to let go. Nothing grows, and only those people who were fortunate enough to put surplus food and fuel in storage will live comfortably to the next warm season. Days get imperceptibly longer as the world struggles to renew itself. It’s the crone time of the year. At this time of the long darkness, people unconsciously turn to brightness. Large fires, bright colors, large feasts are common. Giving to the less fortunate, taking care of your family and neighbors, all these things are essential to success as a community. The saying “It takes a village . . . ” is never truer than during the dark time of the year. Several weeks ago, I signed up for an event taking place for the Solstice. Someone “figured out” that the actual moment the solstice arrived would be Dec. 21 at 6:03 pm. They were trying to get people all over the world to light a candle at 6:03 in their own particular time zone, thus creating a wave of light around the world. I liked the idea. Our Solstice ceremony was going to be planned around that particular event. On Saturday, I figured out what we were going to have at our feast. On Sunday, we went and got the stuff. And a candle. It was a very pretty white pillar candle. We got a beautiful candle holder that looked like it came from an art museum. We did a lot of running around on Sunday, bravely facing down the crowds. I got a new bike helmet. We got all the groceries for the next couple of weeks. We both got hair cuts (three little spoiled rotten girls and an ineffectual mother spoiled that little episode.) We didn’t get back home until the afternoon, and there was still things to do. The groceries had to be put away. Solstice presents had to be wrapped and put under the Christmas tree. And the components of the feast had to be made. I decided on a ham. We haven’t had ham in a long time and it just sounded good. I put it in the oven at 325 for two hours and glazed it at half hour intervals with a combination of raspberry jam and dijon mustard. It was so good! I also made potato fans, Cesar salad, and pretzel rolls. No one. We don’t have a gas stove, but an electric one. It’s easy enough to get a flame going if you feel like filling your house with smoke and having all the smoke detectors going off. And with all the people in the house exhausted from the running around in the morning, and the closest place to procure a match or lighter some fifteen minutes away, it was pretty unanimous. No candle lighting for us. Ah, well. It was a good thought. Then Partner/Spouse said, “We can light a candle. 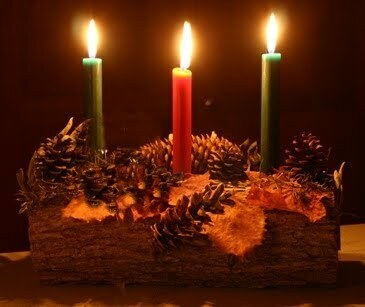 Those!” He pointed to a set of electric candles we had set up for decoration. They would cast a light and that’s what the whole thing was about anyway. Problem solved. At 5:30, I took the ham out of the oven, put the potatoes and pretzel rolls in and started work on setting the table and making the salad. Finally, all was ready, and at 6:17 we sat down to a wonderful meal, good wine, happy friends and family, and good conversation. Until about 6:26, I glanced at the clock and yelled, “No way! We missed it!” We forgot to light our candle at 6:03. Again, oh, well. Whaddaya gonna do? We lit them late and hoped that would count. We had a great time, didn’t dwell long on disappointments, and enjoyed the rest of the evening. I’m sure the spirits were with us and fully understanding of human foibles. We had our dogs, our warmth, and happiness. It’s hard to get much better than that. 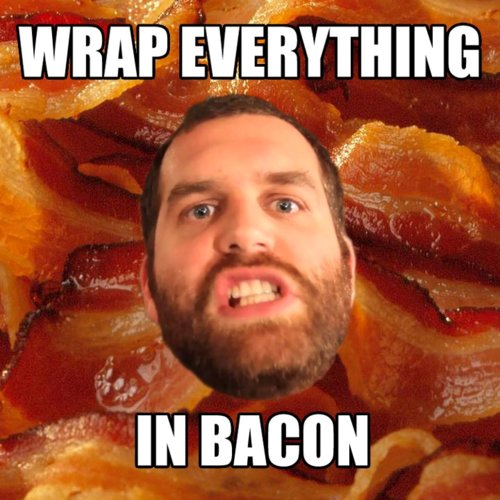 Post # 322 When Is It TOO Much Bacon? I’ve been told that more vegetarians backslide on bacon than anything else. I can believe it. 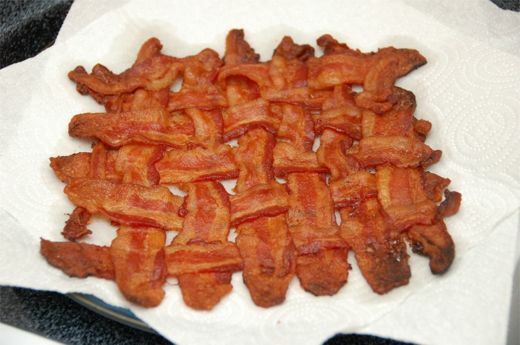 Bacon is wonderful. 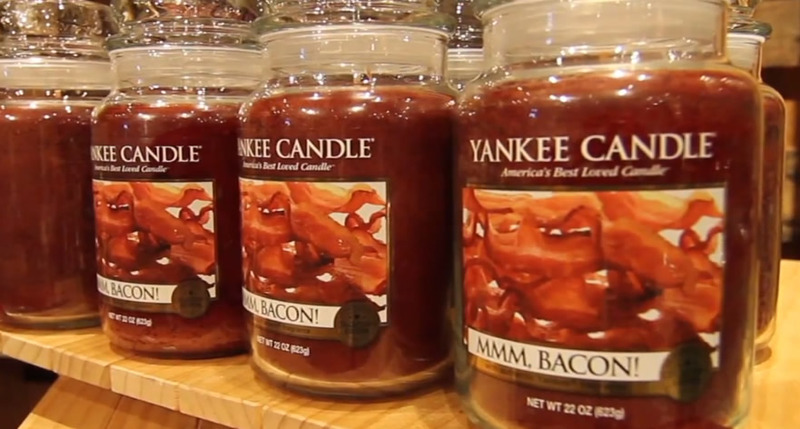 I once worked with a Jewish woman who had to have her office moved to a different part of our building because it was situated directly over the diner on the first floor and scent of bacon wafting through the air every morning was driving her insane. Like I said, it’s wonderful stuff. Yesterday, I was making chocolate chip cookies and like I do whenever I’m cooking, I scoured the internet for a different idea for what I was creating. 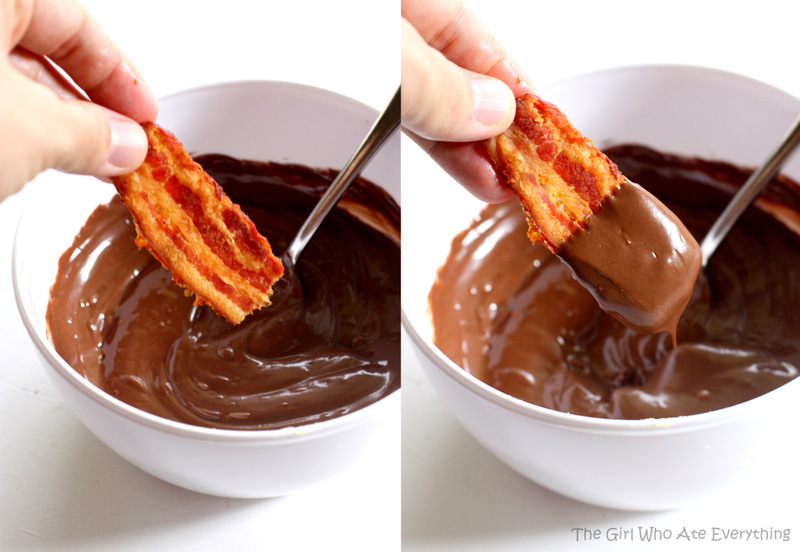 I found someone who included chopped bacon in their cookies. That led me down a different path (Squirrel!) 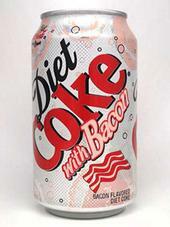 and I started looking at ways that bacon has gotten out of hand. When I was traveling, there was one guy who liked bacon so much, if you wanted any, you had to be at the breakfast bar before him because there wouldn’t be any left after him. Someone once told me that he’d made the waiter got get more bacon and when they brought the tray out, he put more than half of it on his plate. And ate every bite of it. I like bacon, but I can get tired of it, too. We nearly always have it in the house and it’s very easy to fry up a slice or four and make a sandwich, or some other thing with it. Or just eat it right off the plate. With the dogs sitting at your feet praying for a small crumb to drop so they can pounce. We’ve recently got to the point where we fry up one extra piece just for them. 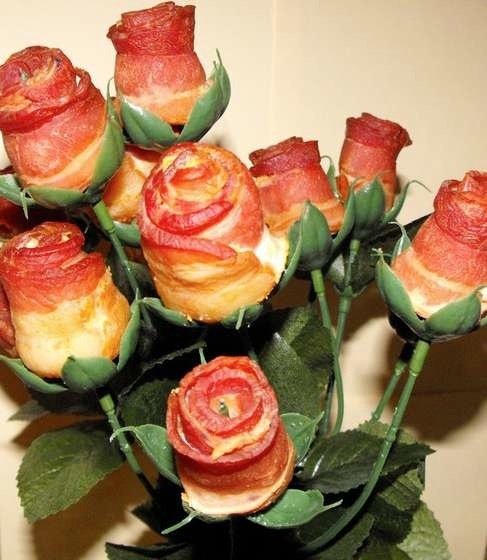 But it seems like the bacon craze has gotten just a little more crazy these days. Remember this? I know people who have tried that. There’s actually a device “out there” that will help you make one of these. When I look at this, all I can think of is how salty that would taste. And I love tacos. When I was in college, my sister and her husband would make Sunday breakfast a special treat and go all out. 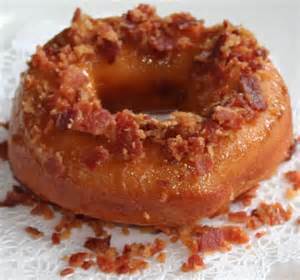 He’d take the bacon and put it on a broiler pan and cover it with maple syrup and broil it so it became candied. I could never bring myself to try it cuz I don’t like maple flavor. But that doesn’t even touch the tip of the iceberg for odd things people have done to bacon. 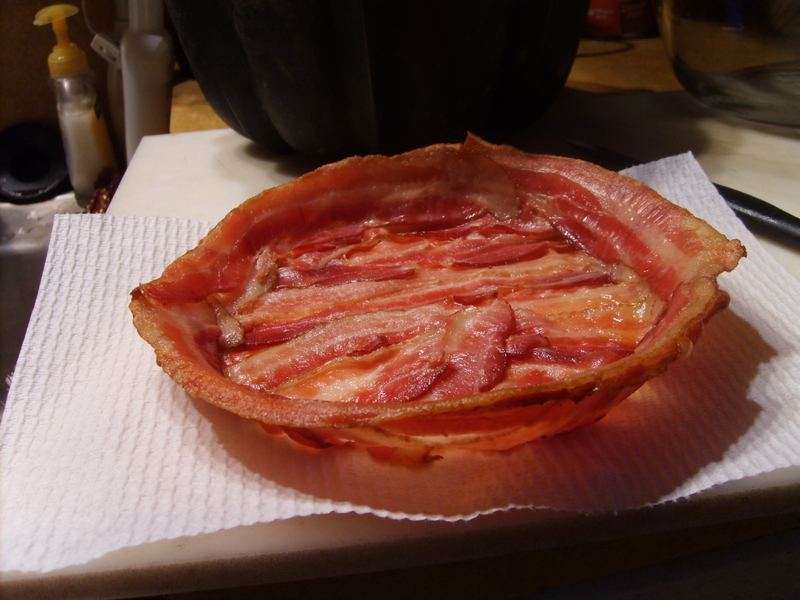 Bacon bowls have become pretty popular lately. But did you know people are making pie shells out of bacon? Oh, yes. And it doesn’t stop there. 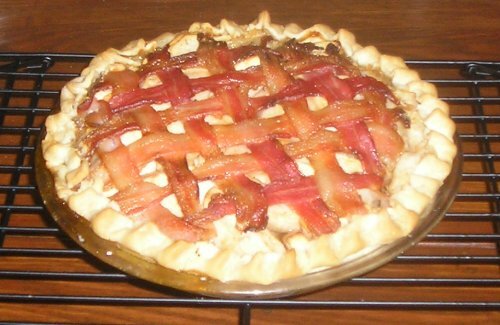 That’s a bacon-topped pie. And it looks to me like the bacon is resting on meringue. And that makes me wonder what the filling for that pie is. 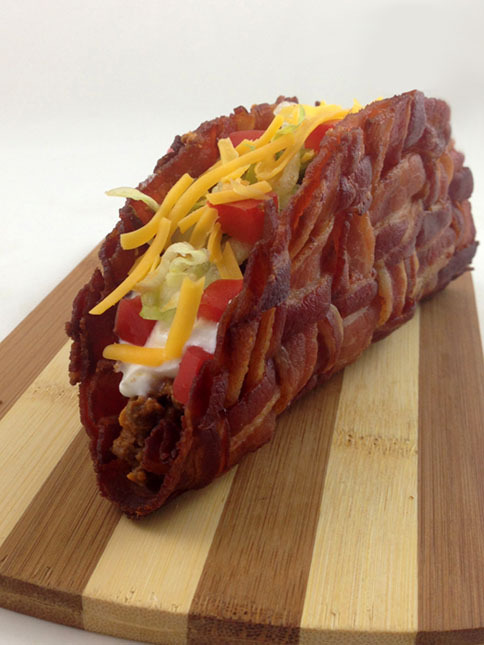 Enhancing food with bacon is an age-old tradition. Bacon bits on salad, bacon on cheeseburgers, bacon in quiche. Someone even came up with a way to make certain they got bacon in every bite of their BLT. 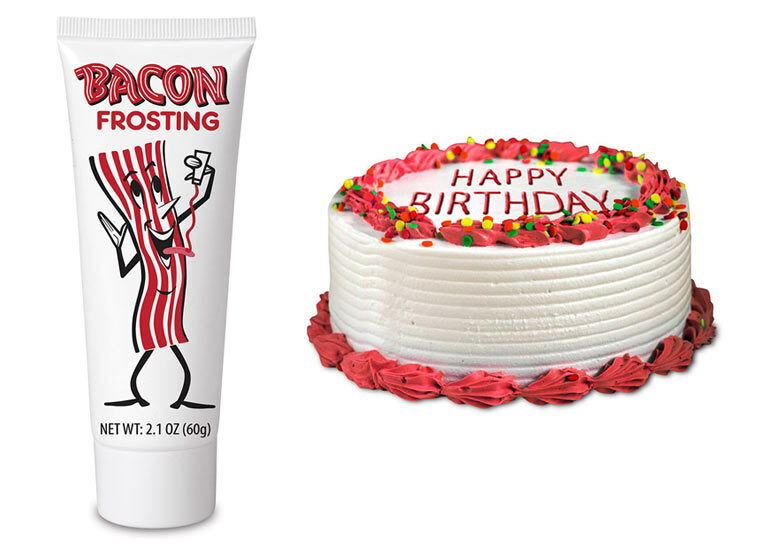 The first is just a sugar glazed donut with bacon bits sprinkles on. 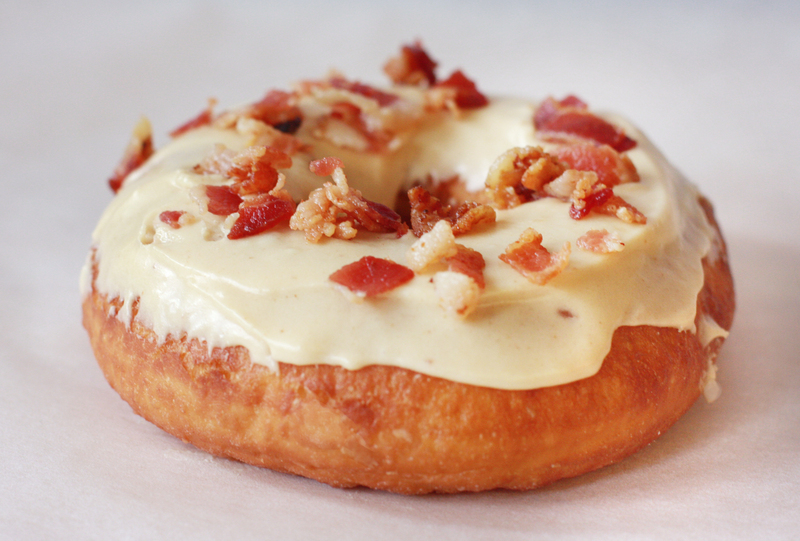 The second is a maple frosted donut with bacon bits sprinkled on. I’m not going to eat either one. 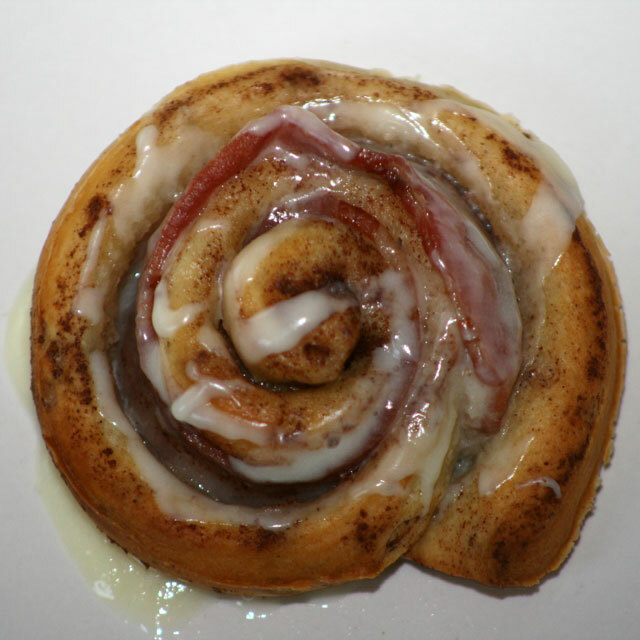 That’s a cinnamon roll with a slice of bacon rolled inside it. It’s baked and cooled and frosted. Again, I’m not gonna try it, but I have to wonder. 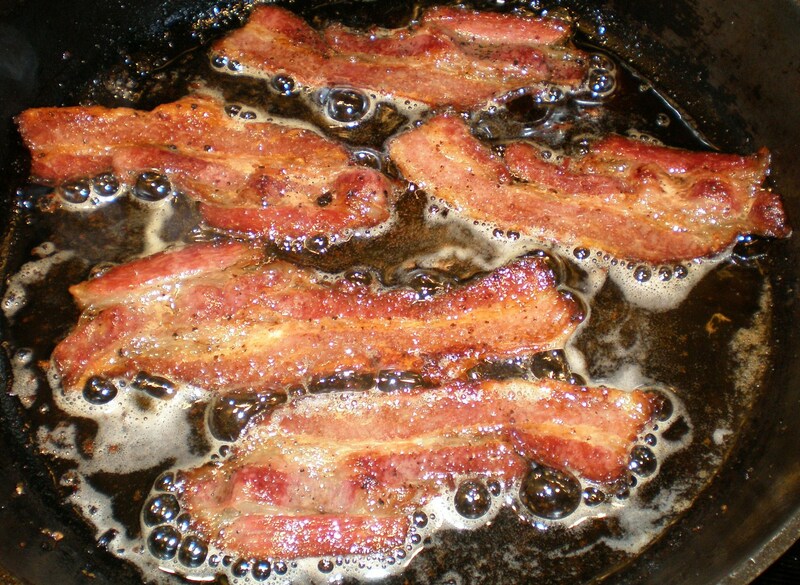 Where does the bacon grease go? Just not gonna go there. 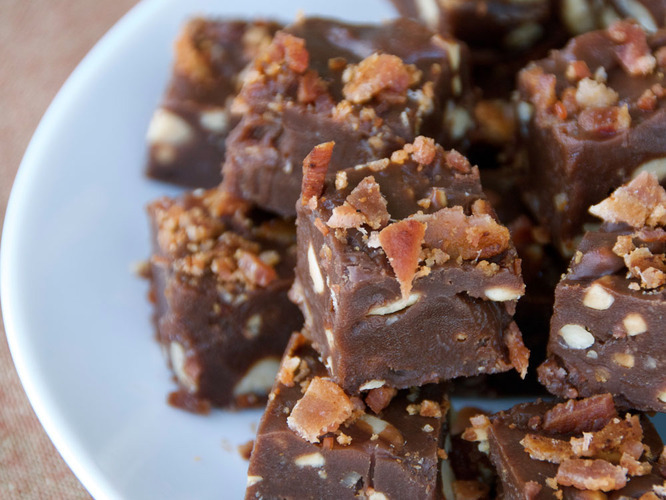 People have tried putting candy and bacon together and this one, I think I’d try, but only after a couple of glasses of wine. It actually looks kind of decadent. This one, though, I’d only try on a bet. 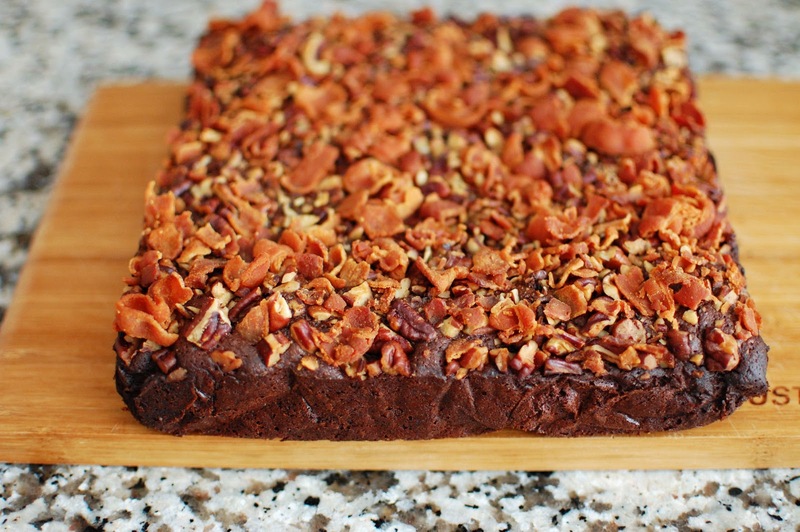 In case you don’t recognize it, that’s bacon topped brownies. I’m going to be making brownies tomorrow. I’m not going to do this. 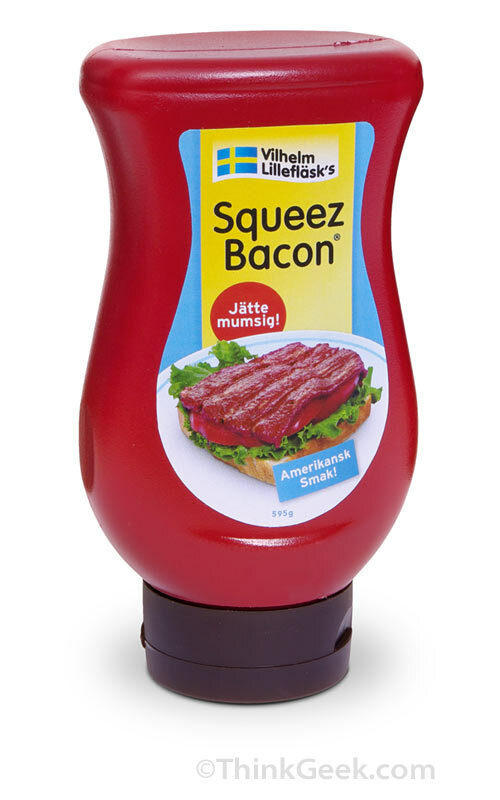 Put suppose you don’t have bacon at hand and want to add it to your current meal? What’s a chef to do? Yes, those are real things. Probably not successful real things, but there you go. 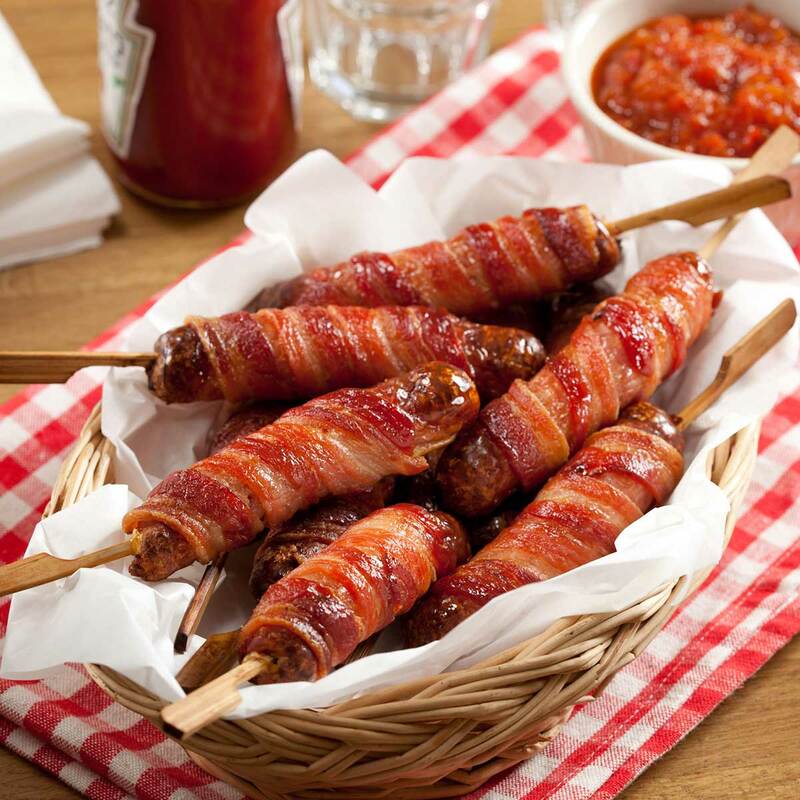 This one is billed as a bacon lollipop, but it looks more like a corn dog wrapped with bacon. Or maybe a sausage, cuz you can’t enough fried pork products in one bite, right? But leaving the world of foodstuffs aside, take a look at these wonderful things. I don’t know if you’re supposed to smell them, eat them, or clean up after them. 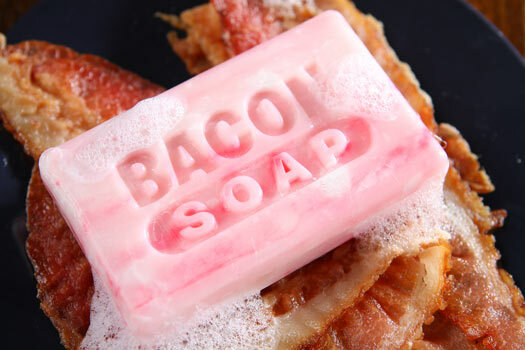 Or you can start your day right with bacon! 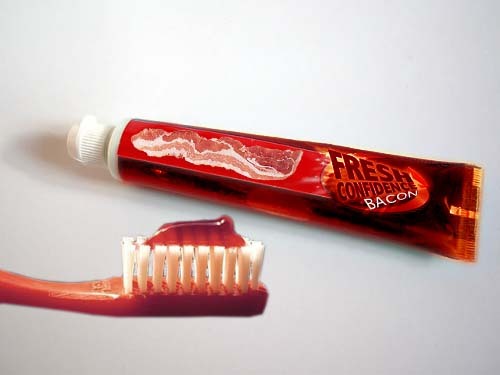 I even saw some bacon flavored breath spray but I thought that was going too far.